West’s Jacob Hall will be playing football at Cincinnati Christian for the 2018 season on forward. Hall was an integral part of an offensive line that paved the way for 3,631 yards of total offense as the team’s center. Hall also contributed at defensive tackle for the Senators. Sheer will and determination can carry you a lot of places that one may have never thought was possible. Over the course of his lifetime, West center and defensive lineman Jacob Hall was told that he couldn’t play football at a high level. The 5-10, 230-pound senior, however, knew that the naysayers weren’t measuring his heart and his passion to succeed on the gridiron. So when faced with the previously mentioned adversity, Hall chose to prove his doubters wrong instead of folding up camp. The Senators’ field general and one of the leaders of arguably a top-three rushing attack across the entire Southeast District not only played an integral role for a team that became just the third West unit to ever win at least one playoff game, but earned an opportunity to play for the Cincinnati Christian University football program. 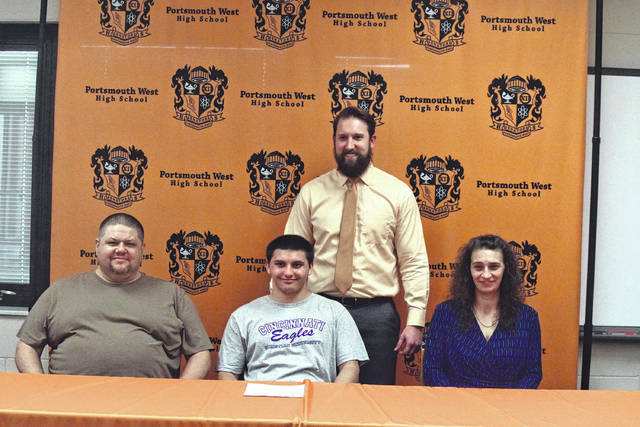 The center/defensive lineman, who signed with the Eagles on National Signing Day, held a ceremony on Tuesday afternoon at Portsmouth West High School as part of the accomplishment. And it’s all thanks to those naysayers that said that Hall couldn’t play football. However, the opportunity is one that Hall not only aimed for from Day One, but took serious pride in as evidenced by his consistent presence in offseason weights and conditioning drills. And as he improved, Hall proved that he could not only play football, but proved that he was an absolute brick wall on the offensive line in the process. Behind a veteran offensive line that included Jakeb Guilkey, Kane Lewis, Brandon Weaver, Cole Gilley, and Caleb Deaver among others in the rotation, West obtained 3,631 total yards for the season — or a mark of 302.6 yards per affair — behind the leadership of Hall and a senior-laden offensive line core, with over 188 yards per contest coming by way of the ground game. Hall spearheaded the line’s efforts with his effective leverage on quarterback sneaks, as it was not uncommon for West to garner between five to seven yards a pop just by telling junior quarterback Dylan Bradford to follow Hall, or dependable No. 52 in other words. Hall’s leadership skills really showed prior to West’s big Halloween Bowl showdown against Wheelersburg in Week 10, when the Senators’ dependable center suffered a broken hand in practice — an injury that normally requires four to six weeks of recovery time. However, knowing that the injury, if treated right away, meant that his high school football career could be over, Hall, knowing that Friday’s game would be the biggest of his life to that point, toughed it out, put padding over it, and readjusted his snapping from both the under center and shotgun variations. West lost against ‘Burg that Friday, but Hall won his own war and finished the year without missing any time — a point that gained a great deal of respect from his own head coach. Since the end of the season, Hall has certainly had no issues keeping himself busy. In fact, the senior participated in the Scout Trout All American Bowl in late January, a high school bowl game that ultimately brought 98 different football players — including Hall — from the Midwestern and Southeastern United States to Mobile, Ala. Hall got extensive playing time at defensive line and fullback — the latter being a position that the 5-10, 230-pound center had never played before prior to the contest — as Hall helped the North squad obtain a 7-0 victory over the South. With his signing set in stone, Jacob Hall’s perseverance and grit is a prime example of what has made the West football program such a fun one to watch over the years. That grit, however, is one that Hall credits his coaches — especially assistants Jerrod and Trevon Pendleton — for continuing to reinforce. And as a coach, one only hopes that the underclassmen apply the same set of traits to their own work habits. https://www.portsmouth-dailytimes.com/wp-content/uploads/sites/28/2018/02/web1_DSC_0466JPG.jpgWest’s Jacob Hall will be playing football at Cincinnati Christian for the 2018 season on forward. Hall was an integral part of an offensive line that paved the way for 3,631 yards of total offense as the team’s center. Hall also contributed at defensive tackle for the Senators. 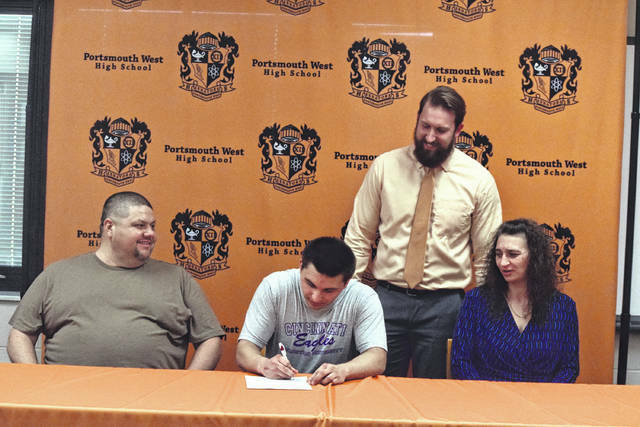 https://www.portsmouth-dailytimes.com/wp-content/uploads/sites/28/2018/02/web1_DSC_0468JPG.jpgWest’s Jacob Hall will be playing football at Cincinnati Christian for the 2018 season on forward. Hall was an integral part of an offensive line that paved the way for 3,631 yards of total offense as the team’s center. Hall also contributed at defensive tackle for the Senators.